This paper aims to understand the strategic meaning of culture as a core competence. In order to fulfill this aim we attempted to understand the effects of cultural values and beliefs on the strategic decision-making process. We used grounded theory method for this inductive qualitative research. We conducted 33 interviews with strategists (business owners and top level managers) from 27 different companies operating in Kayseri OIZ (Organized Industrial Zone) furniture industry. We used conceptual coding procedures to analyze the data. Consequently, we detected a clash of cultural value sets between two different and incompatible cultural value domains named “Western-Rational” and “Muslim-Turkish”, in the field. We also observed that the strategists interviewed were facing with this clash both in their business and daily lives and they were exhibiting different behavioral outcomes in the face of this clash. We classified and conceptualized their behavioral outcomes into two behavioral patterns as the Janissary and the Mercenary behaviors. Finally, we observed that cultural values and beliefs (religious, traditional and rational) are operative at all levels of the strategic decision-making process and thus, they have a strong and deep meaning in strategic management processes as core competences. Bu araştırma çalışmasının amacı, kültürün bir temel yetenek olarak ne ifade ettiğini anlamaktır. Bu amaç doğrultusunda bu araştırma, kültürel değer ve inançların stratejik karar verme sürecindeki etkilerini anlamaya çalışmaktadır. Tümevarımcı nitel araştırmada, temel araştırma yöntemi olarak Gömülü Teori yöntemini kullanılmıştır. Çalışma kapsamında, Kayseri OSB mobilya sektöründe faaliyet gösteren 27 farklı işletmeden 33 stratejistle (İşletme Sahipleri ve Üst Düzey Yöneticiler) yarı yapılandırılmış derinlemesine görüşmeler yapılmıştır. Veriler Kavramsal Kodlama yöntemiyle analiz edilmiştir. Araştırma sonucunda, sahada “Batılı-Rasyonel” ve “Müslüman-Türk” olarak kavramsallaştırdığımız iki farklı kültürel değer alanı arasında bir çatışma olduğu tespit edilmiştir. Ayrıca, stratejistlerin bu çatışmayla hem iş hem de özel hayatlarında yüzleştikleri gözlemlenmiştir. Çalışmada, stratejistlerin bu çatışma karşısındaki davranışsal çıktıları “Yeniçeri” ve “Paralı Asker” davranışları olarak sınıflandırılmıştır. Son olarak, kültürel değerlerin (dini, geleneksel ve rasyonel) stratejik karar sürecinin her seviyesinde cari oldukları ve bu sayede bir(er) temel yetenek olarak güçlü ve derin bir stratejik anlam taşıdıkları gözlemlenmiştir. Al-Jubouri, I. M. (2004). History of Islamic Philosophy: With View of Greek Philosophy and Early History of Islam. Bright Pen. Ansoff, H. I. (1957). Strategies for Diversification. Harvard Business Review, 35(5), p. 113-124. Aumann, R. J. (1997). Rationality and Bounded Rationality. Games and Economic Behavior(21), p. 2-14. Barney, J. B. (1986). Organizational Culture: Can It Be a Source of Competitive Advantage? Academy of Management Review, 11(3), p. 656-665. Barney, J. B. (1991). Firm Resources and Sustained Competitive Advantage. Journal of Management, 17(1), p. 99-120. Bayles, C. M., Aupperle, K. E., & Arogyaswamy, B. (1991). Organizational Culture and Performance. Journal of Managerial Issues, 3(4), p. 512-527. Berardo, K. (2012). Four Analogies. K. Berardo, & D. K. Deardorff içinde, Building Cultural Competence: Innovative Activities and Models . Virginia: Stylus Publishing. Berger, P. L., & Luckmann, T. (1991). The Social Construction of Reality: A Treatise in the Sociology of Knowledge . Penguin Books. Bettenhausen, K., & Murnighan, J. K. (1985). The Emergence of Norms in Competitive Decision-Making Groups. Administrative Science Quarterly(30), p. 350-372. Bøllingtoft, A. (2007). A critical realist approach to quality in observation studies. H. Neergaard, & J. P. (Edt.) içinde, Handbook of Qualitative Research Methods in Entrepreneurship (p. 406-434). Chentenham: Edward Elgar . Bower, B. (1998, July). Seeing Through Expert Eyes: Ace Decision Makers May Perceive Distinctive Worlds. Science News, 154(3), p. 44-46. Bracker, J. (1980). The Historical Development of the Strategic Management Concept. Academy of Management Review, 5(2), p. 219-224. Bradley, B. (1998, August). Extrinsic Value. Philosophical Studies: An International Journal for Philosophy in the Analytic Tradition, 91(2), p. 109-126. Brink, H. I. (1993). Validity and reliability in qualitative research. Journal of the Democratic Nursing Organisation of South Africa, 16(2), p. 35-38. Child, J., Elbanna, S., & Rodriguez, P. (2010). The Political Aspects of Strategic Decision Making. P. C. Nutt, & D. C. Wilson içinde, Oxford Handbook of Decision Making (p. 105-139). John Wiley and Sons. Corbin, J., & Strauss, A. (1990). Grounded Theory Research: Procedures, Canons, and Evaluative Criteria. Qualitative Sociology, 13(1), p. 3-21. Cox, G. W. (1999, Nisan). The Empirical Content of Rational Choice Theory: A Reply to Green and Shapiro. Journal of Theoretical Politics, 11(2), p. 147-169. D'aveni, R. A. (1998). Waking Up to the New Era of Hypercompetition. The Washington Quarterly, 21(1), p. 183-195. D'aveni, R. A., & Dagnino, G. B. (2010). The Age of Temporary Advantage. Strategic Management Journal, 31, p. 1371-1385. D'aveni, R. A., & Gunther, R. (1994). Hyper-Competition: Managing the Dynamics of Strategic Maneuvering. New York: The Free Press. Daymon, C., & Holloway, I. (2002). Qualitative Research Methods in Public Relations and Marketing Communications. London: Routledge. Deal, T. E., & Kennedy, A. A. (1982). Corporate Cultures. Addison-Wesley Pub. Co.
Dess, G. G., & Miller, A. (1993). Strategic Management. New York: McGraw-Hill Inc.
Drucker, P. F. (1969). The Management Practice. Oxford: Butterworth-Heinemann. Ekekwe, N. (2011, February). Competition Beyond Core Competence. Harward Business Review. Erkekoğlu, H., Kılıçarslan, Z., & Göknar, H. (2014, Temmuz-Aralık). Kayseri İlinin Mobilya Sektörü Rekabet Gücü: Açıklanmış Karşılaştırmalı Üstünlük Endeksi. Erciyes Üniversitesi İktisadi ve İdari Bilimler Fakültesi Dergisi(44), p. 1-22. Everet, B. S. (2002). The Cambridge Dictionary of Statistics. Cambridge: Cambridge University Press. Fukuyama, F. (1992). The End of History and The Last Man. New York: The Free Press. Fukuyama, F. (1995). Trust: The Social Virtues and the Creation of Prosperity. New York: Free Press. Geertz, C. (1973). The Interprtations of Cultures. New York: Basic Books. Giberson, T. R., Resick, C. J., Dickson, M. W., Mitchelson, J. K., Randall, K. R., & Clark, M. A. (2009). Leadership and Organizational Culture: Linking CEO Characteristics to Cultural Values. J Bus Psychol(24), p. 123-137. Glaser, B. G., & Strauss, A. L. (1999). The Discovery of Grounded Theory: Strategies for Qualitative Research. New Brunswick: Aldine Transaction. Goodwin, G. (2008). Yeniçeriler (The Janissaries). İstanbul: Doğan Egmont yayıncılık. Hanlon, G. (2016). The Dark Side of Management. London and New York: Routledge. Harman, G. H. (1967, December 7). Toward a Theory of Intrinsic Value. The Journal of Philosophy, 64(23), p. 792-804. Hause, s., & Maltby, W. (2004). Western Civilization: A History of European Society . Thomson Wadsworth. Hofstede, G. (1983). Culture's Consequences: International Differences in Work Related Values. London: Oxford University Press Inc.
Horney, K. (1994). Self-Analysis. Norton Company Inc.
Huntington, S. (1996). Clash of Civilizations and The Remaking of World Order. New York: Simon and Schuster. Isabella, L. A. (1990). Evolving Interpretations as a Change Unfolds: How Managers Contrue Key Organizational Events. Academy of Management Journal, 33(1), p. 7-41. Izzetbegovic, A. (2010). İslam Deklarasyonu: Müslüman Halkların ve Müslümanların İslamlaşmasına Dair Bir Program/Islamic Declaration. İstanbul: Fide Yayınları/Fide Publicaitons. Izzetbegovic, A. (2015). Doğu Batı Arasında İslam/Islam Between East and West. İstanbul: Klasik: Aliya İzzetbegoviç Kitaplığı/Classics: Aliya Izzetbegovic Bookshelf. James, D. (2009). Early Islamic Spain: The History of Ibn al-Qu¯t. London/New York: Routledge Taylor and Francis. Kağıtçıbaşı, Ç. (2000). 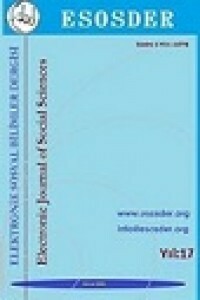 Kültürel Psikoloji: Kültür Bağlamında İnsan ve Aile/Cultural Psychology: Human and Family in the Context of Culture. İstanbul: Evrim Yayınevi/Evrim Publications. Kağıtçıbaşı, Ç. (2006). Yeni İnsan ve İnsanlar: Sosyal Psikolojiye Giriş/New Human and Humans: Introduction to Social Psychology (10 b.). İstanbul: Evrim Yayınevi/Evrim Publications. Kahneman, D., & Tversky, A. (1979, March). Prospect Theory: An Analysis of Decision Under Risk. Econometrica, 47(2), p. 263. Kaya, M. (2014). Geç Osmanlı Döneminde Öykünmeci Modernitenin Boyutları/Dimensions of Mimetic Modernity in The Late Ottoman Period. Fırat Üniversitesi Sosyal Bilimler Dergisi, 24(2), p. 267-275. Keyton, J. N. (2011). Communication and Organizational Culture: A Key to Understanding Work Experiences. New York: Sage Pub. .
Klein, G. (2008). Naturalistic Decision Making. Human Factors, 50(3), p. 456-460. Klenke, K. (2008). Qualitative Research in the Study of Leadership. Emerald Group Pub. Ltd.
Koçu, R. E. (2004). Yeniçeriler/Janissaries. İstanbul: Doğan Kitapçılık. Krueger, J. I. (2008). Rationality and Social Responsibility: Essays in Honor of Robyn Mason Dawes. New York: Psychology Press / Taylor and Francis Group. Lewis, B. (2007). Europe and Islam. Washington D. C. : AEI Press. Mardin, Ş. (1991). Türk Modernleşmesi: Makaleler 4/Turkish Modernization: Articles 4. İstanbul: İletişim Yayınları/İletişim Publications. Mardin, Ş. (2008, Mayıs 23). Mahalle Baskısı/Neighborhood Pressure. (R. Çakır, Röportaj Yapan) İstanbul. Martí, J. M. (2012). Towards a New Theory of the Firm: Humanizing the Firm and the Management Profession. Fundacion BBVA. Mayo, E. (1949). Hawthorne and the Western Electric Company: The Social Problems of an Industrial Civilisation. Routledge. McNeilly, M. (1996). Sun Tzu And The Art of Business. New York: Oxford University Press. Meriç, C. (1986). Kültürden İrfana/From Culture to Irfan. İstanbul: İnsan Yayınları. Meriç, C. (1995). Jurnal/Journal. İstanbul: İletişim Yayınları. Mooney, A. (2010, August). Core Competence, Distinctive Competence, and Competitive Advantage: What is the difference? Journal of Education for Business, 2(83), p. 110-115. Neuman, W. L. (2014). Social Research Methods: Qualitative and Quantitative Approaches. Essex: Pearson Education Limited. Nguyen-Phuong-Mai, M. (2017). Intercultural Communication: An Interdisciplinary Approach: When Neurons, Genes, and Evolution Joined The Discourse. Amsterdam: Amsterdam University Press. Nursi, S. (2000). Mektubat/The Letters. İstanbul: Sözler Neşriyat. Nursi, S. (2001). Lemalar/The Flashes. İstanbul: Sözler Neşriyat. Nursi, S. (2006a). Lemalar/The Flashes. İstanbul: Envar Neşriyat/Envar Publishing. Nursi, S. (2006b). Sözler/The Words. İstanbul: Envar Neşriyat/Envar Publishing. Ocak, A. (2013). Türkler ve İslamiyet: Türklerin Müslümanlığı Tarihine Dair Bir Sorgulama. AİBÜ Sosyal Bilimler Enstitüsü Dergisi: Semih Tezcan'a Armağan(13), p. 251-260. Ovans, A. (2015, May). What is Strategy, Again? . Harvard Business Review. Palmer, J. A. (1952). Origin of Janissaries. Bulletin of the John Rylands Library, 35.
Pepper, S. C. (1942). World Hypothesis: A Study in Evidence. Los Angeles: University of California Press. Peters, T. J., & Waterman, R. H. (1982). In Search of Excellence: Lessons from America's Best-Run Companies. Harper Collins. Pettigrew, A. M. (1979). On Studying Organizational Cultures. Administrative Science Quarterly, 24(4), p. 570-581. Pitney, W. A., & Parker, J. (2009). Qualitative Research in Physical Activity and the Healthcare Professions. Human Kinetics. Porter, M. E. (1998). Competitive Strategy: Techniques for Analyzing Industries and Competitors. New York: The Free Press. Prahalad, C. K., & Hamel, G. (1990, May-June). The Core Competence of The Firm . Harvard Business Review, p. 79-90. Rue, L. W., & Holland, P. G. (1989). Strategic Management: Concepts and Experiences. New york: McGraw-Hill Publishing Company. Schein, E. H. (1993). On Dialogue, Culture, and Organizational Learning. Organizational Dynamics, 22(2), p. 40-51. Schein, E. H. (2004). Organizational Culture and Leadership (3 b.). San Fransisco: Jossey-Bass. Schoemaker, P. (1982). The Expected Utility Model: Its Variants, Purposes, Evidence and Limitations. Journal of Economic Literature, 20(2). Schreier, M. (2012). Qualitative Content Analysis in Practice . London: Sage Pub. Schwartz, S. H. (1977). Normative Influences on Altruism. L. B. (Edt.) içinde, Advances in Applied Social Psychology (p. 222-275). London: Academic Press. Sebora, T. C., & Cornwall, J. R. (1995). Expected Utility Theory Vs. Prospect Theory: Implications For Strategic Decision Makers. Journal Of Managerial Issues, 7(1), p. 41-61. Simon, H. A. (1957). Models of Man: Social and Rational. New York: Wiley Pub. Simon, H. A. (1977). The New Science of Management Decision. Englewood Cliffs-NJ: Prentice-Hall. Smircich, L. (1983). Concepts of Culture and Organizational Analysis. Administrative Science Quarterly, 28(3), p. 339-358. Strauss, A. L. (2003). Qualitative Analysis for Social Scientists (14. b.). Cambridge: Cambridge University Press. Sugden, R. (1986). New Developments in the Theory of Choice Under Uncertainity. Bulletin of Economic Research, 1. Thomas, R. R. (1990, March-April). From Affirmative Action to Affirming Diversity. Harvard Business Review. Thomson, J. E. (1994). Mercenaries, Pirates and Sovereigns: State-Building and Extraterritorial Violence in Early Modern Europe. New Jersey: Princeton University Press. Tversky, A., & Kahneman, D. (1986). Rational Choice and the Framing of Decision. The Journal of Business, 59(4), p. 251-278. Weick, K. E. (1979). The Social Psychology of Organizing. Reading, Massachusetts: Addison-Wesley Publishing Company. Woolston, H. B. (1902, January). Religious Emotion. American Journal of Psychology, 13(1), p. 62-79. Yıldırım, A., & Şimşek, H. (2013). Nitel Araştırma Yöntemleri/Qualitative Research Methods (9. b.). Ankara: Seçkin/Sosyal Bilimler. Zafirovski, M. (2003). The Rational Choice Approach to Human Studies. Human Studies, 26(1), p. 41-46.